Looking NE at Newmarket Farm Cottage. Sunday was a beautifully warm sunny day. As usual this brought several visitors, including a couple, one of whose family had been agricultural labourers for at least 3 generations in the local area. He was also interested in local history. They stayed for a while, looking for finds from both the spoil heap and the demolition rubble mound. They collected quite a variety of ceramics, glass and bone. Also found from amongst some nearby bushes were large fragments of a shallow ceramic sink, some thick glass similar to the mirror glass found on site, and an entire ‘Harris & Co, Brighton’ screw top bottle. Harris & Co. were a Brighton brewers known to have made ginger beer between 1873-1935. The screw top indicates a relatively late date. 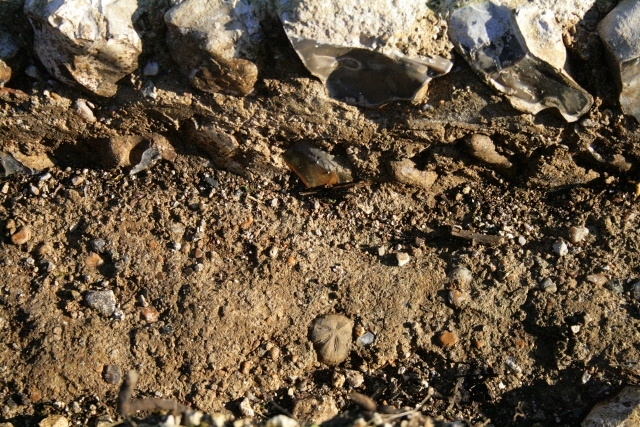 Location of a fossil sea urchin (‘shepherd’s purse’) embedded in mortar at base of foundation trench against east wall of cottage. 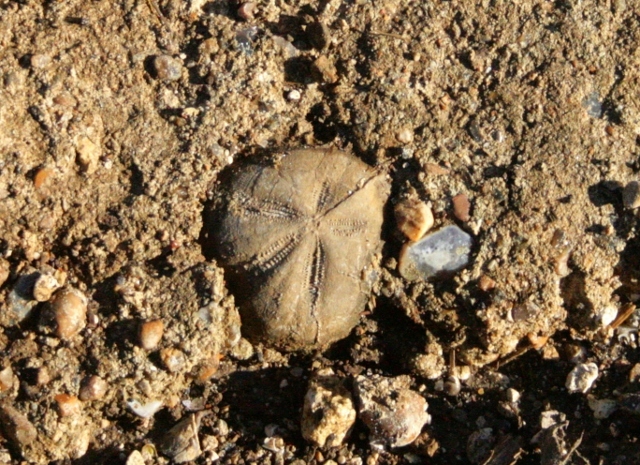 Of potentially great importance, exposed by the recent heavy rains, was the finding of a fossil sea-urchin (shepherd’s crown) found embedded in the mortar at the bottom of the foundation trench on the west side of the cottage, and whose top face was just clear of the surrounding mortar. This was almost certainly deliberately placed, yet this would have been immediately buried by the chalk-rubble backfill of the farmyard butting against the side of the cottage. Its location was almost exactly where we had previously found the base of a hand blown glass bottle, and some large butchered cattle bones, sitting directly at the bottom of the foundation trench. Nothing else was found from the excavation of the foundation trench fill over the wedge of mortar against the outside of the east cottage wall. 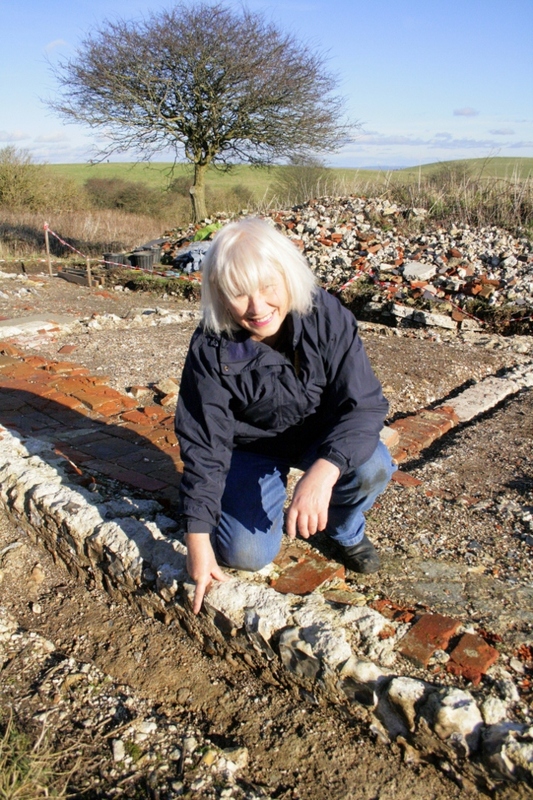 Were they chance deposits, or superstitious ritual by the 1830’s builders? The 19th century inhabitants of the Sussex Downs were well known for their superstitious beliefs. Meanwhile, digging continued, squaring off the trenches, this time over the east side of the path south of the garden gateway. Another square metre was fully excavated. The path does not appear to have had an eastern edge, and the downhill slope was not as steep as expected. Finds were not particularly numerous. A wide range of ceramics including a particularly beautiful pink decorated shard with a metal glazed pattern, glass, metal – including .303 cartridges, and a section – sawn at both ends – of a large scapula blade, probably bovine. Fingers are crossed for dry weather Friday morning 24th Jan – SeSurveying plans to do the 3d hi-res laser scan they offered some time ago. Once completed, for the next two Sundays (26th Jan & 2nd Feb) we will dig two small sondages to determine whether a back-filled well (or rainwater tank) may have existed in front of the cottage; also the ceramic gully drain will be completely excavated in hope that we can find a manufacturer’s name; and possibly, the front door step may be lifted in search of datable finds below. 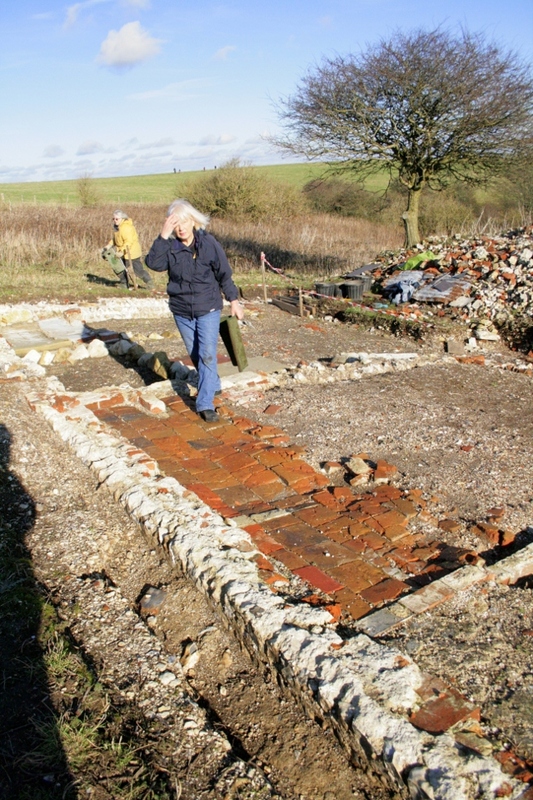 Also, surveying will need to be completed, before the dig is backfilled, sometime in the first week of February. 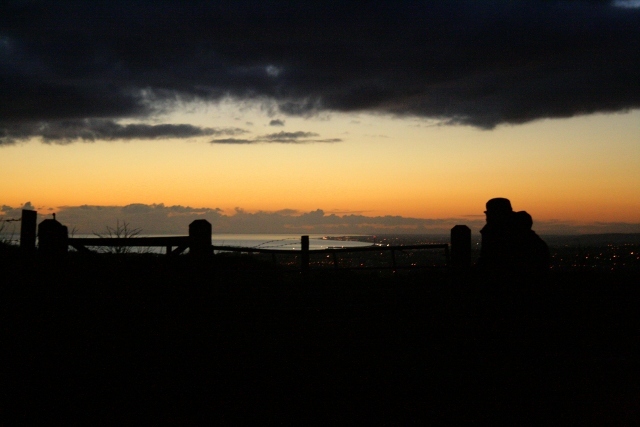 Sunset over West Sussex from Newmarket Hill.